Taffy Cannon grew up in Chicago, graduated from Duke University in North Carolina, then passed through Texas on her way to Southern California, where she has felt entirely at home for the past quarter-century. She is the author of fourteen published novels in which a great many people die, often unpleasantly. Her work includes both series and standalone mysteries, an Academy Award-nominated short film, and Convictions: A Novel of the Sixties. Her books have been finalists for Best Novel in the Agatha, Macavity, Left Coast Crime Western Regional, and San Diego Book Awards. Her Booked for Travel mystery series, written under the pseudonym Emily Toll, has visited Sonoma Wine Country, California Gold Rush country, Autumn in New England, and the Florida Keys. She completed The Tumbleweed Murders, a Claire Sharples Botanical Mystery begun by her friend and colleague, Rebecca Rothenberg, who died in 1998. She has worked a multitude of odd jobs from carnival barker to professional feminist, but intends her epitaph to read: “She Never Waitressed.” She once correctly wagered everything on a Women Writers Daily Double as a Jeopardy contestant. 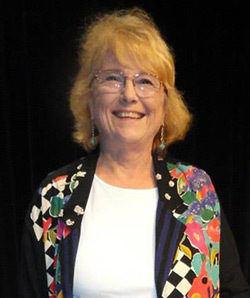 She lives in Southern California and was named Carlsbad Citizen of the Year 2014 for service to the Carlsbad City Library, where she runs the Friends Bookstores. In 2003 she received the President’s Volunteer Service Lifetime Achievement Award for giving over 4000 hours of community service.